Cleveland's Arizona League affiliate boasted the league's most potent offense and one of the best pitching staffs. On Monday evening in Goodyear Ballpark, the Indians utilized both strengths to cap off a near-perfect season with a championship. Behind a 12-run sixth inning and five frames of three-hit ball from Shao-Ching Chiang, the Tribe's Rookie-level club won the AZL title with a 14-0 rout of the Giants. "The guys went out there and got it done," Indians manager Anthony Medrano said. "It was amazing. A lot of hard work from those guys and now they're celebrating. They've got the music going and they're getting their rings sized. We played a very good game against a good team in the Giants. The first five innings it was 1-0, then [reliever Justus] Sheffield got us out of a jam in the sixth and then we scored 12 runs." It caps a flawless season for Medrano and his team, who lost just 16 games en route to being crowned first- and second-half champions in the Arizona League Central Division. The Indians went 17-11 to seal a playoff berth before going 20-5 after the break to wrap up the circuit's best regular-season record and earn a first-round bye in the postseason. The Indians led the circuit with a .269 team average, 35 homers and 332 runs scored in 53 games. The team's 3.51 ERA was second-best only to the Dodgers and their 74-run differential was the biggest of any club. "I think we led the league in hitting and were second in pitching," Medrano said. "It was a combination of both because without one of those, it's hard to win. But the biggest thing was guys kept pulling for each other and never letting up." On Monday, the hitting and pitching clicked in tandem once more. Third baseman Yu-Cheng Chang, who homered in Sunday's semifinal, went 4-for-5 with a solo homer, a double, two RBIs and two runs scored as he missed hitting for the cycle by a triple. Second baseman Willi Castro and center fielder Bobby Ison collected two hits and three RBIs apiece out of the last two spots in the order. 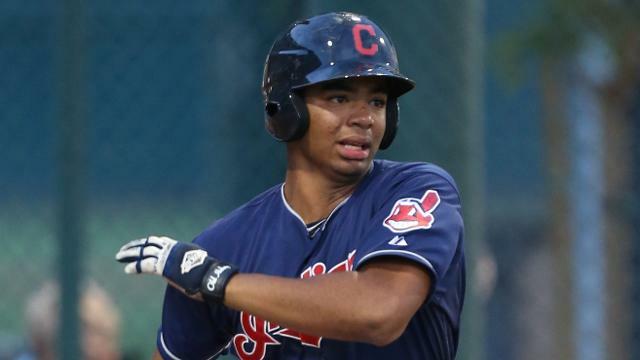 First baseman Bobby Bradley, the league's Most Valuable Player and Triple Crown winner (.361 average, eight homers and 50 RBIs), added a pair of hits for the Indians, who won a league-best 12 games in the second half to advance to the postseason. Bradley crossed the plate twice in the sixth when the Indians sent 17 men to the plate and scored 10 of the 12 runs with two outs. "It was so much fun," Medrano said. "Guys were up on the top step cheering every moment of it. It was a great atmosphere. The last inning they were saying, 'Three more outs, three more outs.' The atmosphere was amazing. Then they dogpiled on the mound and I was hugging all the coaches."